You’ll never guess who hit a tie-breaking homer for the St. Louis Cardinals last night. Shockingly, it was Yadier Molina. Yes, of course we all can — not much of a shock anymore. Just Yadi being Yadi again … and again and again. 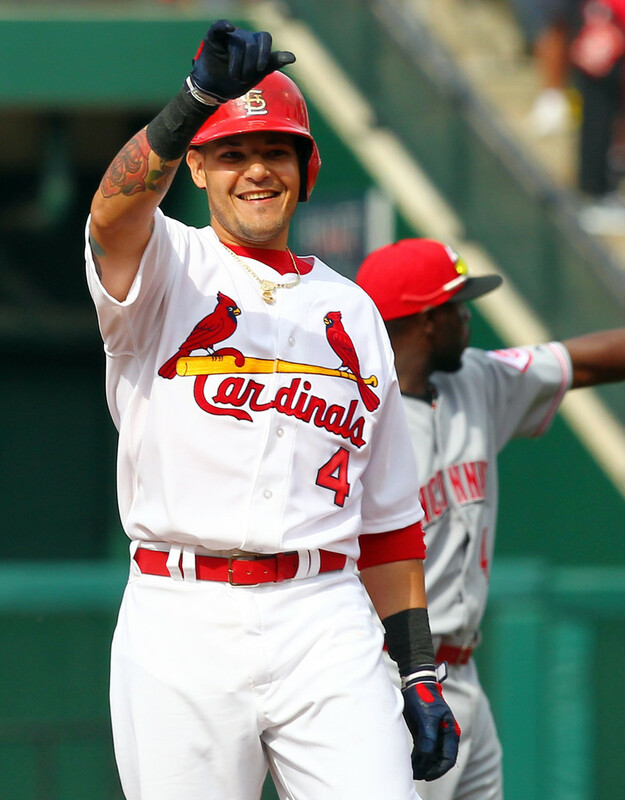 And Yadi’s BAMF-ness on Wednesday came in the form of a homer with Allen Craig on base in the bottom of the 6th to give the Cards a 3-1 lead. It was his only hit of the night, so he knows how to make them count. When asked before the game how his team could get Yadier Molina out, Cubs manager Dale Sveum had a simple answer — you don’t. You just have to hope he hits it at someone. Molina has sharpened his All-Star claim and inflated his average against the Cubs all season. In five games, Molina has slugged .736 against the rivals, and his one-for-four Wednesday dropped his average against the Cubs to only .526 (10 for 19). Molina has reached base in 17 of his last 19 home games against the Cubs. Yadi, however, is not perfect. The Cubs only run of the night was unearned and scored in a sloppy second inning in which first Matt Carpenter and then Yadi made errors. But, of course, he made up for it. And Jake Westbrook was much improved in his second start since coming off the DL. He allowed 2 hits in 7 innings with 2 strikeouts and 3 walks — plus got 14 ground-outs. Trevor Rosenthal and Edward Mujica also improved on their performances from Monday night, as neither allowed a hit in his respective inning pitched. Rosenthal struck out 2 while walking 1, and Mujica retired the Cubs in order for his 21st consecutive save. The 2 hits allowed by the Cardinals pitchers made it the fifth time this season they have held an opponent to 2 hits or less, according to Tom Orf. It didn’t happen at all in 2012. So the Cardinals roller-coaster June continues on the upswing today. Since last Tuesday, June 11, they’ve won and lost every other game — making June 9 and 11 the most recent time they’ve won back-to-back games. They’ll try to make it two straight wins tonight as this 4-game series with the Cubs wraps up starting at 7:15 p.m. Scott Feldman and Lance Lynn are the starters. And not that I wouldn’t be rooting for them anyway, but I definitely want the Cards to win tonight. My Cubs fan brother and Cards fan nephew will be at Busch Stadium — and who deserves to be the one taunting the other afterward? This entry was posted in 2013 Season and tagged Edward Mujica, Jake Westbrook, St. Louis Cardinals, Trevor Rosenthal, Yadier Molina by Christine Coleman. Bookmark the permalink.